The Port of Portland, in conjunction with Business Oregon and our office, just put out a press release covering the latest trends for Oregon exports. There is a lot of good nuggets of information included in the release. Do read the whole thing. Our contribution largely related to the impacts, or lack thereof, of the tariffs and strong dollar. What follows below is the summary our office pulled together as part of our latest forecast materials. 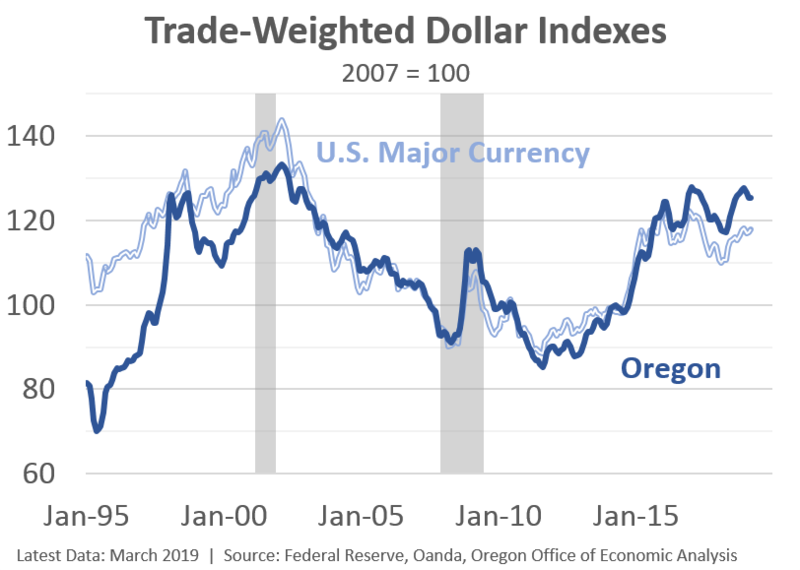 The strong U.S. dollar and ongoing trade tensions are worrisome but not yet problematic or detrimental to the Oregon economy overall. Oregon tends to rank 10th highest, or so, nationwide when it comes to the value of exports as a share of state GDP. Additionally, the economic impact is larger than this as many other states’ products ship through Oregon on their way to destinations along the Pacific Rim. China and Canada remain the number one and two destinations for Oregon made products, respectively. Combined they account for more than one-third of all Oregon exports. And for the time being at least, there is good news for Oregon firms exporting to both markets. First, exports to Canada have rebounded strongly in the past 18 months. 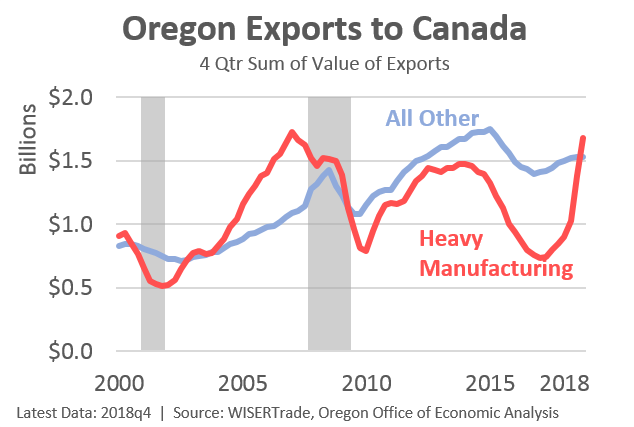 These gains are driven by heavy manufacturing exports (machinery, transportation equipment, and metals) which have historically accounted for half of all Oregon products sent north. Much of the recent increases can be tied to heavy trucks. 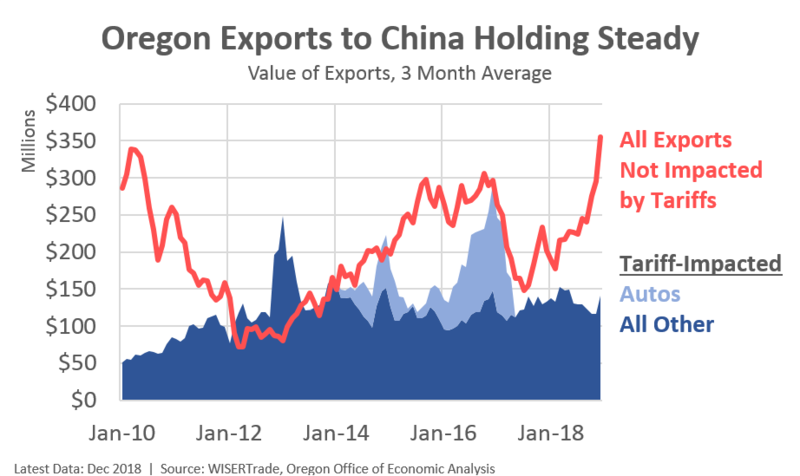 Second, despite the ongoing trade tensions with China, Oregon exports have yet to see any declines. This is not true at the national level. However only about one-third of Oregon exports headed to China are subject to proposed or enacted tariffs. Such exports, at least for the time being, are holding steady. Importantly, many of Oregon’s top exports are not subject to tariffs and are seeing ongoing gains in trade, including electrical and industrial machinery. Given the strong dollar and global growth, it should be expected that Oregon’s total exports will slow moving forward. This is particularly true for the state’s non-technology exports which more closely follow the business cycle and not the product development cycle of each new generation of chips. Should trade tensions rise further, and/or the dollar continues to appreciate, Oregon exports may decline outright. Exchange rates have cooled some in early 2019 following their peak in December. Our office will continue to monitor these trends to gauge their impact on the U.S. and Oregon economies.